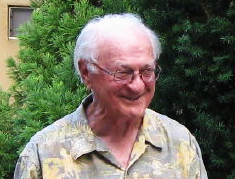 Anyone who lived in Roanoke, VA during the 1960s or 1970s will remember Kenney's, a regional restaurant chain owned and operated by Bill Kenney. These days, Bill is no longer in the business. A few restaurants remain in places such as Buena Vista and Lexington which—while not affiliated with him—at least carry the original menu. See the Kenney's website for a very good history of the restaurants and info on the few that remain. Perhaps the most unique menu item at Kenney's was the "sauce burger." 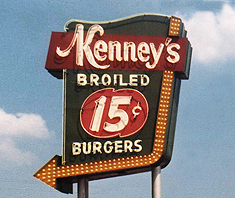 Burgers were cooked on a "roto broiler" then dipped into Kenney Sauce before being placed on the bun. Onions and / or mustard could be added and the combinations were referred to by initials, e.g. an "SMO" meant "sauce, mustard and onions" (these were my personal favorites). I clearly remember a cold day in early 1979 when I went with my then-girlfriend to the Kenney's in Salem and had two SMOs for lunch. For years I thought those would be my last. 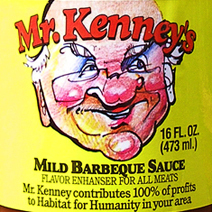 So as you can guess, I was elated to find out a few years ago that Mr. Kenney is still alive and well, making and selling his sauce. One can buy it from any Roanoke-area Kroger store and the profits are donated to the local chapter of Habitat for Humanity. I'm not sure what is in Kenney Sauce. The recipe is one of Mr. Kenney's closely guarded secrets. He calls it "a mild barbecue sauce" but I always thought it was a mixture of ketchup, mustard and a smattering of pickle relish, among other things. Regardless, upon learning that it was again available I bought several bottles and began making my own Kenney burgers and gained quite a bit of weight in the process. Sautee' the celery / onion / garlic. Let cool. 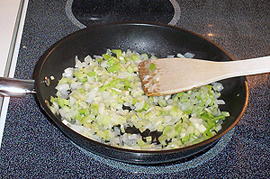 Saute the celery, onion, & garlic. 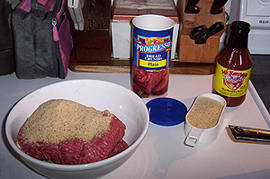 Mix the above with the meat, bread crumbs and half the bottle of sauce in a big bowl. 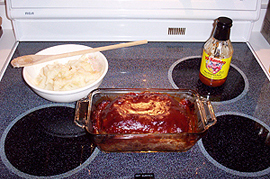 Make into a loaf, put in a meat loaf dish, and cover with the rest of the sauce. 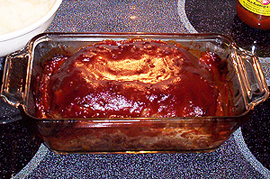 Make loaf, cover with sauce. Cook about 90 minutes at 350. 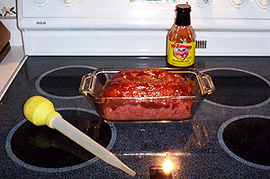 You will frequently need to draw off the juices with a turkey baster. You will notice a decline in the amount of juices as it gets done. Remove from oven, let it cool for at least ten minutes, and serve. Mashed potatoes make a GREAT side dish.